One of our friendly, polite and respectful teams will arrive promptly at your property at a pre-booked time, convenient to yourself. At this point we ask that you inform us of any items which you may need located and retained. These could include sentimental items such as photographs, mementos or possibly important legal documents needed to settle affairs. 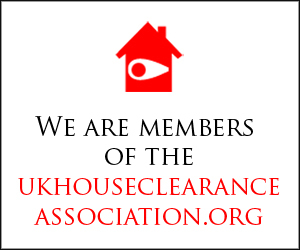 We carry out all types of house clearances, we are available Monday – Saturday and offer free quotations, our house clearance service offers comfort and piece of mind. We clear everything requested in a house clearance from furniture, bric a brac, carpets, fridges, cookers, and can even lift carpets if required. We have many years of experience working with home owners, landlords, estate agents and solicitors nationwide. We often come across things of value in a house clearance such as jewellery, forgotten cash and antiques, we have built up a lot of trust over the years and will always advise the client of these items if found. When the initial walkthrough has taken place and the order has been agreed, our team will begin clearing the property with the utmost respect and the minimum of disturbance to you and your neighbours. Once the clearance has been completed we will again walk the property to ensure that we have left everything as discussed. Once it has been established that you are completely satisfied with the service we have provided we will present you with a full invoice, we can also provide you with a waste transfer note to absolve you of responsibility for all items removed if needed and finally a receipt for payment. Bereavement clearance can be a very hard, stressful and painful process, whether it be a friend or relative that has passed away. We understand at this time you need a discreet, reliable, professional house clearance company that you can trust. Whilst working with dignity and respect in mind we will remove all unwanted items we can even clear the food from the cupboards if needed. We will always arrive at the agreed time and have never let a customer down. We usually clear out the smallest room in the property first for items that you (our customers) feel have monetary or sentimental value, such as photographs, important legal paper work or jewellery. We are a friendly, family run business and always work towards customer satisfaction. 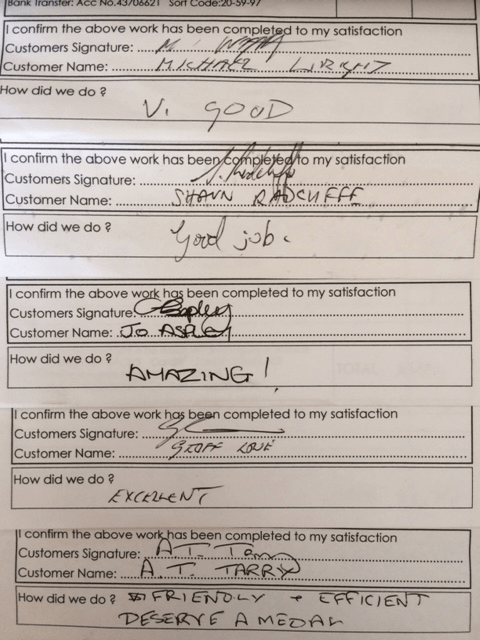 We know that the house clearance process can be very upsetting therefore our staff are very kind and understanding. You will be treated with upmost respect and compassion throughout the whole process. Your loved ones effects will be professionally cleared in a discreet manor. 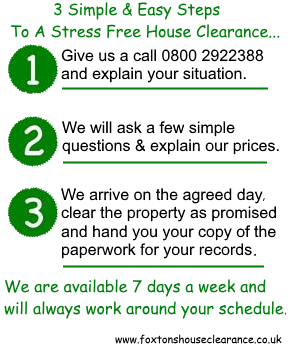 We have dealt with all kinds of house clearances over the years and dealt with all situations requested. We class a cluttered house clearance as one of our specialities, we deal with them 7 days days a week and our staff are highly trained for this sort of clearance. We understand that a cluttered property has usually managed to get that way by a disorder such as hoarding or emotional blocking as explained above, therefore we will always work with and advise our clients on ways that they can avoid the property to end up the same way in the future. Our staff are very kind, thorough and reliable and are always on hand ready to help. This is an additional service which is only available to clearance clients. This service will return a property to a living or working standard after prolonged periods of inattention. Our cleaning service will also increase the chance of sale or letting of a property. The focus will be on bringing out the best of the property in spite of any physical limitations the age or condition may present. This service will include all rooms dusted, vacuumed, woodwork wiped clean and internal window frames and sills cleaned. Unable to be present on the day ? If you need to make house clearance arrangements, but live some distance from the property or simply can’t be there due to other arrangements, we can arrange to collect keys from a friend, neighbour, probate administrator or an estate agent that is dealing with the estate. Usually, we take before and after photos of the work carried out to provide you with for your own records. Once we have completed the work as instructed we will then return the keys to where we collected them or we can post/forward them to another address or company if requested.